I haven’t blogged much over the last year, except to rage over my pet political issue, so imagine my surprise when I was invited to the Novartis Blogging Summit for TSC. *Insert legal disclaimer here–While I was not paid for my time at the summit, my travel, hotel and food expenses were paid by Novartis. * They also gave me a box of kittens. No. I’m kidding. Only one lousy kitten. Four other moms to kids with TSC were also there. Tina of Captain Jacktastic, who I initially met around the time I started this blog through WordPress and later Facebook. Heather who has written several pieces for Huffington Post, and I met for the first time last year in DC during the TS Alliance’s March on the Hill to continue funding for the Tuberous Sclerosis Complex Research Project. Laurisa of Land of La, who was one of my early stalking victims when I was finally able to do TSC research for more than two minutes at a time without “breathing” into a paper bag. And Stephanie of Lanier Landing, who was the only one I had really never had any social media contact with, but I had stumbled across her blog when seeking other TSC kids in Epidiolex trials. At the time, her son was the only one I knew of. The day I left, Connor seemed to have a bit of cold and Chris thought he was coming down with it as well. This is called foreshadowing — but I’ll get into that later. I was picked up at the Newark airport by a man holding a sign with my name. I am accustomed to such a lifestyle as I force my husband to stand in the driveway most days and greet me in this manner when I come home. It turned out Laurisa had shared my turbulent flight that wasn’t quite in a “luggage bins popping open” category, but definitely required gripping of the arm rests and the parents in front of me to intervene with their 10-year-old who was launching a panic. The driver whisked us to the Short Hills, New Jersey Hilton where I luxuriated briefly in the softest king bed ever then headed down to the hotel bar to meet the other ladies. We had dinner with several Novartis employees and shared our stories so they could have insight on what it’s like to live day-to-day with TSC. For those that don’t know, Novartis produces Afinitor, a medication that can shrink certain types of tumors that occur in TSC. Connor, fortunately, does not have a need for this medication at this time, but it would be a likely course of treatment should he ever develop a SEGA in the brain or large AMLs in the kidneys. It’s weird to sit and talk about your kid and TSC without having to give a bunch of background information, explaining what certain acronyms mean or why a particular medication might be preferable to another. They already know and they’ve already been there. When dinner wrapped up at 8, we caught the train into NYC to meet another TSC mom who lives in the city. Correction, four of us went. Tina’s no fool. She wasn’t about to let a king bed, personal hotel room and a long, luxurious shower without the door cracked listening for shenanigans pass her by. We met fellow TSC mommy Naomi at Haymaker Bar, a few blocks from Grand Central Terminal, ordered drinks and appetizers and talked about some more acronyms that needed no defining. Heather revealed that Times Square was on her bucket list and since I was pretty much intent on spending every minute I could squeeze out of this 24-hour trip in NYC, I was fully supportive of her checking that item off. We trekked through the tourist mecca, which was hopping on this Friday night. As we passed by the Disney store, we were drawn inside by the sheer number of people inside at midnight. Apparently a large number of tourists venture all the way to New York and decide, as one day rolls into the next, that they simply MUST HAVE AN ELSA DOLL RIGHT NOW. It was amazing. And a little sad. But mostly amazing. We caught the train back to Short Hills where we bonded further as we almost spent the night in the station. The hotel didn’t offer much hope of a taxi and their shuttle service had stopped. Our first Uber driver was too stupid to find the train station. No we are not shopping at Trader Joe’s at 2 am. The second one found us, but appeared to have only been a licensed driver for a day or two. At any rate, we made it back to the hotel where it took me another hour to fall asleep, still high off neon and LED lighting (did you know that the Times Square district is the only district with a requirement for businesses to have illuminated signs and that there is a minimum, rather than maximum, lighting requirement)? The next day was filled with discussions of TSC, diagnoses and, most importantly, what kind of resources would we have liked to have had when we received the diagnosis. We spoke of the fear of what was out there on the Internet and at least one person had been told to stick to TSAlliance.org and not to Google. Period. Novartis unveiled some new informational pamphlets for our feedback and said they are revamping their informational site. There were some other resources they want to be sure the TSC community is aware of. The Afinitor $25 co-pay card. This only works with commercial insurance (not Medicaid). If your co-pay is more than $25, print this out and take it to the pharmacy. Afinitrac. This support program offers financial and educational support, deals with your insurance and provides other resources. Please note they are only allowed to offer it to patients who are using Afinitor on-label. If you are using it off-label (meaning for something it has not been officially FDA-approved for yet, like seizures or cognition) they are prohibited from providing this support. Turbo & Scott. Previously the story book about a kid named Scott who has TSC was only available online, but it is now in print. It goes into a lot of detail about TSC in more kid-friendly terms. It’s a bit complex for younger kids or kids who are cognitively affected, but for older kids, siblings, or friends, it can be a great resource. There is also a comic book about a teenage Scott on a quest to meet others with TSC. I was not required to share these resources or blog about the summit in order to attend, but I wanted to make sure people know about these resources as for many of us, the use of Afinitor (Everolimus) could very well be on the table one day, if it isn’t already. And so I headed home where I would soon learn that the cold was not a cold…but more about that in my next post. A full update on Connor to come and the reasons why I’ve dropped off the mommy blogging planet. Living with Tuberous Sclerosis, and having children with Tuberous Sclerosis, is always a rollercoaster of the unknown. You never know when this disease is going to put a tailspin on our health. The constant stress of dealing with insurance, therapy, school, doctors, sickness, testing — it all gets to you when you only have 24 hours in a day. That is not including everyday work that needs to be done around the house, bills to pay, events to get to, and the list goes on. It is a never ending battle to not show how badly this disease can affect how I feel. The day must go on, and even though I am a stay-at-home mom, a lot is depending on me to make our every day routine run smoothly. I realize nobody is safe from having symptoms from this disease. That really hit me a couple years ago. I have lived with this disease symptom free for 42 years. The only time there was any symptom was when I had seizures when I was little, but at that time there weren’t MRIs to diagnose Tuberous Sclerosis. I went years thinking I had childhood epilepsy that I outgrew at puberty. As I get older, the hardest part is dealing with the emotional aspects of this disorder. I find my anxiety seems to get higher as I try to learn to juggle my health, my boys’ health, and all the obstacles that come with this disease. My kidneys have taken the biggest hit from this disorder. I have to take a pill for the rest of my life that is considered to be a chemo drug that has all new symptoms that can happen to my health. It is really hard to stay positive when you feel like crap inside. The hardest part is that people think you feel like crap because you’re overweight, which I am, but it really does not come to that. Of course losing weight could help me, but so much with this disease, there is no guarantee that will solve all of my problems. I hear blood pressure, cholesterol, and all that good stuff will be better, but the fact is, my wonderful miracle drug that I have to take for my kidneys cause both of those to be bad. It is a struggle that I am still trying to learn to balance but with the fatigue, lower back pain, and symptoms nobody wants to really hear about, it is a daily problem to try and get better. I now have to take medicines I hate to take, but my family needs me so I take them. 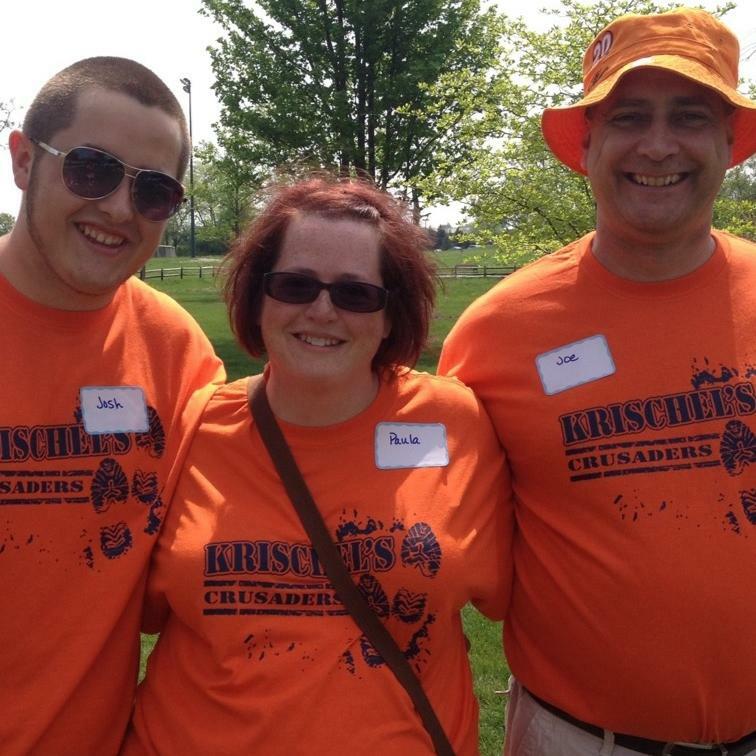 The best part of this disease — it has made my family stronger. NO ONE is not affected by this disease in our family. My son Josh, does not get to always have a normal childhood because his brothers got sick, had a seizure, or are just off from their autism. Most children are privileged to have both parents go to award banquets, sporting events, and school plays. Not our family. Most days we have to take turns going so one parent can stay home for our other two boys that have Tuberous Sclerosis as well. My husband works very hard to take care of our family and to help out as much as possible when I am having bad days. He truly is my rock, my best friend, and my soul mate. He does not judge me; he gives me time to spend with friends and helps as much as he can with the boys. This disorder has put us in many different stressful situations, but with our faith, we always seem to conquer the obstacles one by one. The most important part I have to remember is to always take a proactive look at my health so I can be there for my boys. Please, to all of you adults out there, be proactive. You never know when you will have a new problem with TS. At one point I was really having bad back pains. I found out my tumors growing in my kidneys were causing the pain. Always listen to what your body is telling you and get things checked out. I had to start Afinitor immediately so I could avoid surgery. To me that is my best option because I still need to take care of my family. I may feel like I am an 80-year-old lady at times, but with my husband by my side, I know I can push through anything. He is my best supporter, along with my 15-year-old son who would give up anything if it meant helping his momma out. I am a very lucky woman, to have such a wonderful family. I also have some amazing friends that get me out of the house when I just need a break from the hustle and bustle of everyday life. It is also wonderful to live in small town America, with a population of 4200 people. Everyone knows our children through school, church, and being out in the community, and I know they have our backs if our children are ever in need. It took me a long time to accept this disorder, but now I am determined to do everything I can to live a long healthy life. It is important to be here for my family. Another important thing to do as an adult with TS is find some kind of support. I know not every family member can understand how you feel, friends don’t always understand, and people can feel alone. I found solace in getting to really know some wonderful women and men on the Tuberous Sclerosis Facebook pages. NO ONE is affected exactly the same with this disease, but there are enough similarities that you can get ideas to ask your professionals to see if it may help you or your loved ones. These people live our life, they pray for you, give you encouraging advice, and can make the healing process bearable as we fight on for a cure. I feel very rich by the friendships I have made, and I am ready to help those who are just learning about this disease. I will give EVERYTHING, but UP!! I will trust in God, trust my doctors, and trust my family to be by my side as I battle this incurable disease and battle to be the best I can be. Thank you for listening. 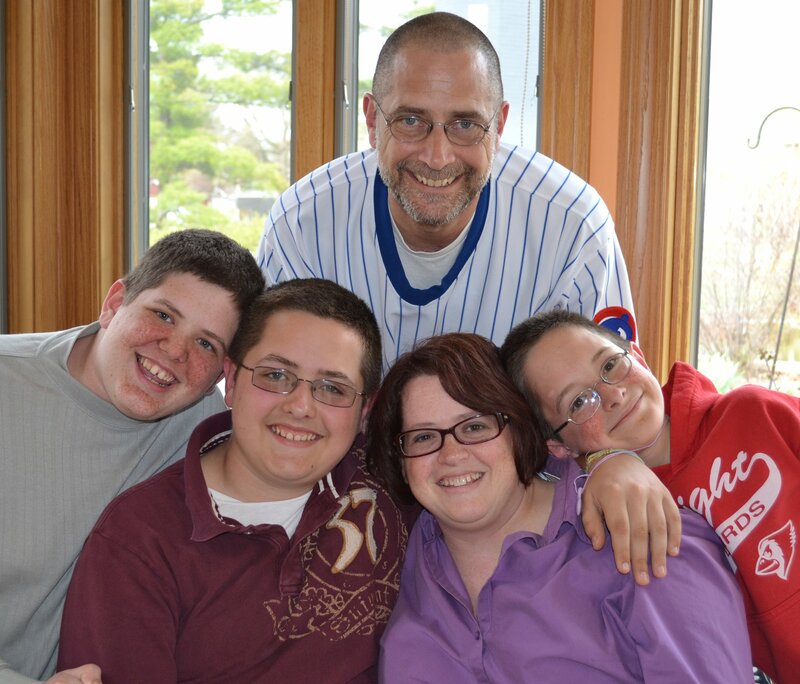 Read more about Paula’s family in her guest post for last year’s Blogging for Awareness. Please also check out her son Josh’s contribution last year from the perspective of teen with an affected mom and siblings. Waiting for a seizure to happen is no way to live. At the end of August 2011, I found out I was pregnant with my second child. My husband Joe and I had been married for 10 years and decided to have one more child so my 3-year-old daughter would have a sibling as we didn’t want her growing up an only child. I got pregnant quickly and we were thrilled. At the end of 2011 I found out I was having a boy. I had no problems during the pregnancy and the doctors said everything looked good. My c-section was scheduled April 18, 2012. On that day I had a beautiful 8 lb 3 oz boy and we named him Cayden George Perry. He was the most beautiful little thing and I was immediately smitten. There’s just something about that mother-son bond. I couldn’t keep my eyes off of him. The birth went smoothly and ,other than a weird red mark on his forehead, he was perfect. My husband and I asked several doctors about the red mark on his head and they would always tell us it was trauma from when he was inside of my stomach or it was a birthmark or it was a bruise. No one actually seemed to know what it was. No one seemed concerned either. Aside from the red mark on his head, he had several large white patches on his legs and arms. And again, we were told they were birthmarks. After we got out of the hospital, we saw our regular pediatrician. We again asked about his white spots and red mark. We were told the exact same thing. Everyone felt comfortable guessing but no one could give us a definite answer. They said he was fine and we shouldn’t be worried. At 4 ½ months we figured out exactly what those ‘birthmarks’ were. As a mom, I notice everything. 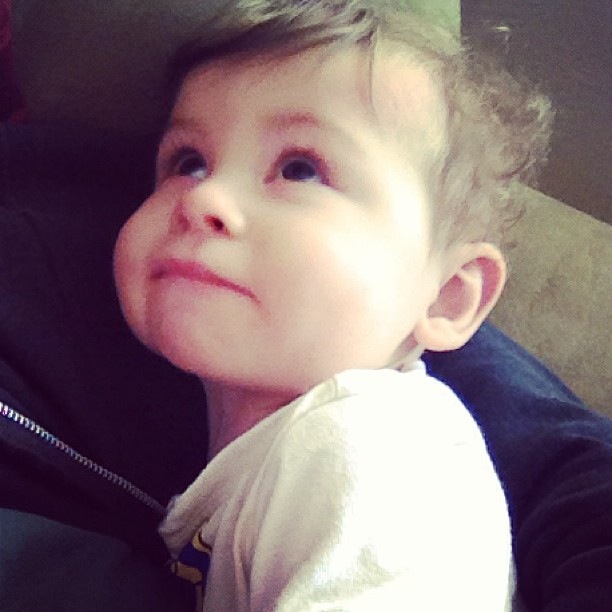 I noticed when I would cuddle Cayden sometimes, his body would stiffen up and he would scream out as if he were in pain. I called the pediatrician several times over the course of a week and each time I’d call, they’d tell me it was likely teething, give him Tylenol and that they didn’t feel it was necessary to see him. I told them I saw no bumps in his mouth but they insisted he was fine and I was overreacting. After a week of dealing with this, I was extremely worried. Tylenol wasn’t helping and nobody seemed to believe me when I told them I suspected something was wrong with Cayden. I got the “you worry too much” speech from nearly everyone. On the Sunday before Labor Day, he started having one of the episodes and I yelled for my husband to please take a closer look at him. I knew it wasn’t normal. “I think he’s having a seizure.” Those words from my husband will stick with me forever. He scooped up Cayden and took off to the ER. I got my daughter ready and we hopped in my car and followed. The ER doctor agreed with my husband that Cayden was definitely having a seizure but he didn’t know why. He was on the phone with a neurologist when the nurse came in to ask about the red mark on Cayden’s head and the white spots. We said we had asked several doctors and were told they were birthmarks. At that time, I was so confused. 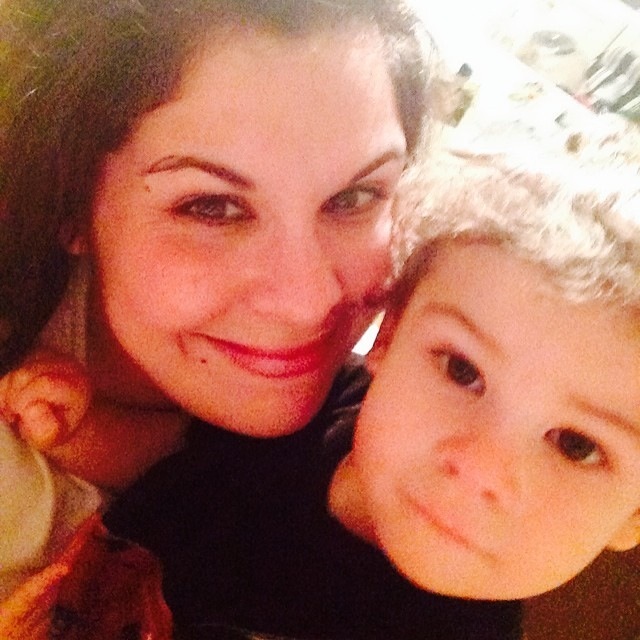 Why was my son having seizures? What could white spots have to do with it? A few hours later, Cayden was life-flighted to a larger hospital an hour away. The doctor felt the white spots and the red mark were genetic markers for something called Tuberous Sclerosis, which I had never heard of. I made the mistake of looking it up online. I was terrified of what was going to happen to my little boy. 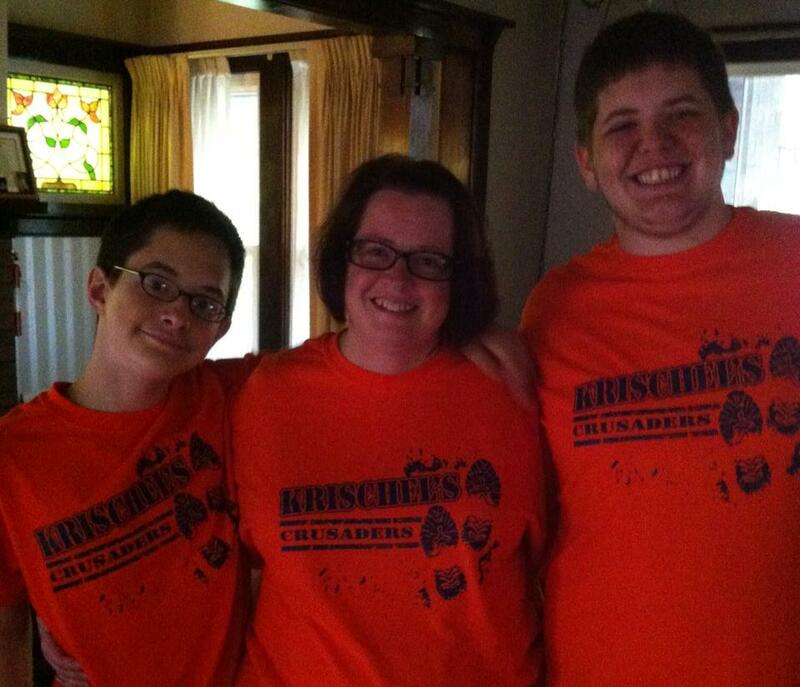 The next day, they did a full body MRI on him and confirmed the diagnosis of Tuberous Sclerosis. They mentioned a drug called Sabril that they’d order for him and they were confident it would be helpful in stopping the seizures. He spent 10 days in the hospital and while the seizures didn’t come as often, they were still happening multiple times a day. Joe and I made the choice to move his treatment to Cincinnati Children’s Hospital. From our research, this was one of the best hospitals to treat Tuberous Sclerosis. We started there at the beginning of October 2012. Much to our surprise, on our first visit there, Cayden was also diagnosed with polycystic kidney disease. It seems the old hospital, while they did do a full-body MRI, never read the results. We had brought the MRI on disc with us for the new neurologist to review and the nephrologist reviewed it as well because after taking Cayden’s blood pressure and seeing it was through the roof, he suspected PKD. My husband and I were devastated. We were just getting over the shock of Cayden being diagnosed with Tuberous Sclerosis and now this??!!! It was just so much to process. They put him on blood pressure medicine and the neurologist made some changes to the dosage of his Sabril. Even at the max dose, Cayden’s seizures still continued. And from that point, they continued another four months until a miracle happened. For four months multiple meds were tried. Nothing seemed to help my son. Watching your son have multiple seizures daily is simply heartbreaking. I sunk into a depression and I d idn’t think I could pull out of it. I shut everyone out of my life. I was devastated that nobody could seemingly help my son. In January 2013, we discussed Afinitor. The doctor decided to take him off of Onfi (as the side effects were too harsh for Cayden). We began to wean Cayden off Onfi and we were to start a medicine called Dilantin while waiting to get approved for Afinitor. After three days on Dilantin, something changed with Cayden. When we woke up on a Sunday morning we heard Cayden in his crib moving around and making noises. I was baffled when I walked into his room. He smiled at me! Then he laughed! And then, of course, I cried! I hadn’t seen that beautiful smile in five months. He was so happy and I can’t describe the feeling I felt seeing him smile. I felt my prayers had been answered. I felt like for the next few weeks I was waiting for the bottom to fall out. But waiting for a seizure to happen is no way to live. So I tried my hardest to just enjoy the seizure-free time that we got with Cayden. Prior to starting Dilantin, he was set up for brain surgery in April of 2013 at NYU Medical Center. The surgery wasn’t successful and while that was extremely disappointing, I was glad that we at least had Dilantin to help with the seizure control. Cayden just turned 2 April 18th of this year. He’s just learning to crawl and stand, he’s saying a few words and he’s sitting on his own. Six months ago, he was doing none of that. I have such a tough, strong, determined little boy! He is my hero and the absolute love of my life. I am so grateful that God gave me such an amazing child and I feel truly blessed to be his mommy! Looking at Alex you would never know there is anything wrong with him. Alex has blonde hair, blue eyes and a smile that will capture your heart from the start. Alex has always been such a happy little boy. No matter what he is going through, he always has a smile on his face. Even though Alex cannot vocalize his wants and needs, we as a family have learned how to communicate with him in different ways. And being strong parents, makes for a strong little boy, who is being given the best care and love that can be given to our special little angel. There are never enough words that I could find to describe the love I have for my son Alex. In the past three years he has taught so many people so many things. He has taught me so much, that in a lifetime with him I would never be able to repay him for all that he’s taught me. Alex was born July 14, 2009, and the moment Alex was born he made an impact on everyone around him. We were told when Alex was born that he had two holes in his heart and a heart murmur. The doctors were very hopeful that the holes would close before he reached two years old. The holes closed by the time Alex was a year old on their own. At this time we had thought that our prayers had been answered and Alex would be fine. Little did we know that there was another plan for us. I noticed early on that Alex was not big on sleeping; he would sleep for a hour then wake up screaming. He was also not hitting his developmental milestones like normal children would. After numerous trips to his doctor, we were told Alex was normal and just had colic. We knew it was not colic that we were seeing. It was something else, but as young parents we didn’t really know what it was that Alex was doing, other than not sleeping. Alex has always been a big child with a big head and big body; he came into our lives at a whopping 9lbs 8 oz. But as he grew his doctor was concerned about his growth being so big, so she sent us in for an ultrasound of his brain. 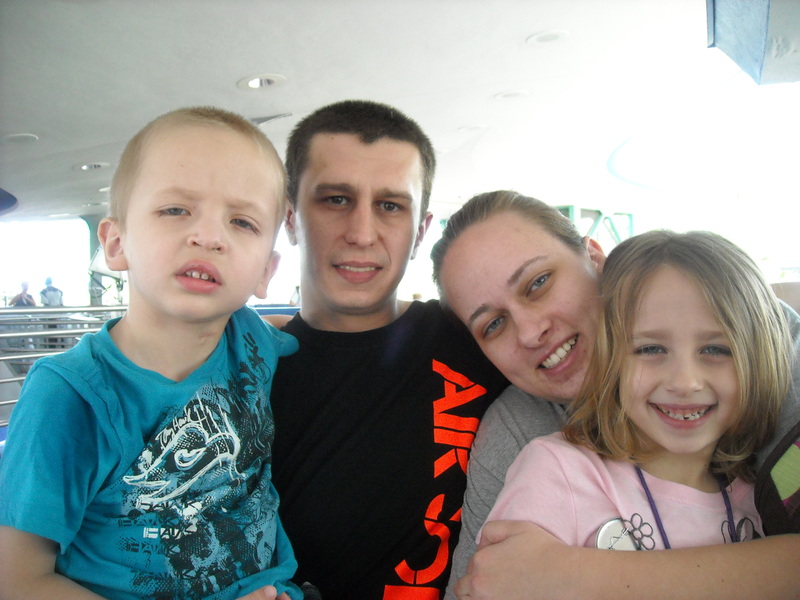 We found out Alex had calcifications on his brain and hydrocephalus. Hydrocephalus is when you have too much fluid on or around your brain, and his doctor told us we just had to monitor Alex; if over time it got worse, we would address it then. In February 2010, we learned Alex had severe hearing loss in both ears. After a few hearing tests, the doctors told us it was nerve damage, and they didn’t know if he would ever be able to hear. They suggested we try putting tubes in his ears. We did get the tubes in March 2010, as well as his adenoids taken out. Alex started to vocalize then. It was like a whole new world was opened up to him when he could hear. In June 2010, while taking a bath, Alex was not acting right, so we took him into his room and kept an eye on him. This is when I experienced seeing my first seizure. At the time I had no idea what a seizure looked like. Alex was pale and laying so still on the bed just staring at the ceiling. I remember feeling so scared. I have never felt more scared than that moment looking at Alex. Within a minute or two, Alex came out of it and went to play. We watched him closely thinking he just didn’t feel well. The rest of the month, Alex did this three more times. The third time we decided to go to the emergency room. After describing what we saw, the emergency room doctors told us that Alex had a seizure, and because he had a fever, it was just febrile seizures. Febrile seizures usually go away when you reach age 5, but when you have a fever as a child you have a seizure. The doctor told us he would grow out of it. We were relieved that he would grow out of it and everything would be okay. In August 2010, on our third trip to the emergency room, the doctors grew concerned because now Alex was having seizures without the fever. The febrile seizures diagnosis was thrown out the window. They admitted Alex and ran a ton of tests from blood to urine to an MRI of Alex’s brain. The very next day, Alex’s pediatrician came into the room to talk to us. She said she had the results from all the tests but wanted to look at Alex for herself with this “wood light”. I agreed, and shortly after starting she stopped and sat down next to me. She started to cry and explain to me that the hospital staff of doctors, as well as her believe Alex had a disease called tuberous sclerosis. As she cried, she told me that Alex’s life would be very short; he would not talk, would not walk, or do things a normal child would. She told me to have Alex get a blood test to confirm this diagnosis and then make an appointment with the genetic doctor of the hospital. We did that and saw the genetic doctor on October 1, 2010. It was in that very appointment that I found a side of me I never knew I had. I found a strength I had never seen before, as well as a voice for Alex that I never knew I had before. After not one, but two doctors told me my son would never walk or talk, let alone do anything a normal child could do, I made a promise to Alex that I would do everything in my being to allow him to have as normal of a life as I could give him, as well as get him the best care I could as far as doctors are concerned. A few days later I found the TS Alliance and found the TS clinic in Chicago, and ever since then I have never looked back. Alex now has a great team of doctors and nurses that know us and love Alex so very much. Over the past two years, we found out Alex has severely obstructed sleep apnea, and that is the reason why he has not slept his whole life. Two surgeries later and Alex’s apnea is worse than when we started. Alex’s seizures have become more frequent up to six times a day, even with taking two different medications to help control them. Alex’s neurologist suggested that Alex would be a great candidate for a vagal nerve stimulator. A VNS is similar to a pacemaker but it is for the brain. It is hooked up to the vagal nerve in the neck and sends a pulse to the brain either at five-minute, three-minute, or one-minute intervals to help control the seizures. Alex was implanted on November 26, 2012, and the VNS was turned on Dec 6, 2012. Since the VNS was turned on we have not seen any seizures at all. We are off one of his seizure medications and almost off the other. This is a long-term help that we were in desperate need of. After an MRI in August 2012 we learned that Alex’s two SEGAS we were monitoring had grown a lot over the past three months, and Alex was a candidate for a medication called Afinitor. Afinitor is a medication that, to me, is a miracle drug. It helps people with tuberous sclerosis complex, not only with the problem they are taking it for, but in many other aspects too. See, Afinitor has shrunk Alex’s SEGAS by 20 percent in only three months of taking it, as well as helped him be more focused and develop cognitively. We know that we as a family have a long road ahead of us, but it’s because of Alex that we have the strength to keep going. Alex has been through so many MRIs, blood tests, and hospital stays that he has shown us what a true warrior is by staying so strong during all of it. I feel truly blessed to have Alex as my son; he is one amazing little man. Brian and I had been married for four years. Like most first-time parents we were excited to be expecting a baby and equally excited to have an ultrasound to learn the gender. We had spent weeks talking about names and imagining how the child would look, wondering what personality traits they would have, if they would get my clumsiness gene or Brian’s athletic abilities. My first ultrasound was around nine weeks to verify dates, and I had another ultrasound around 16 weeks to learn the gender. We were pleased to learn we were having a boy. Brian’s visions of teaching the baby to play ball and coaching little league were starting to become a reality. Shortly after we learned we were having a boy we decided on the name, Cole Ryan. My prenatal visits went along as planned. I jokingly told my doctor (whom I absolutely love) that I was disappointed that we didn’t get any good pictures of Cole at the first ultrasound and maybe I needed to have another. We both laughed! As my pregnancy moved along, around 30 weeks my doctor said that Cole was measuring small and maybe it was time for another ultrasound just to make sure we had the correct dates and that there was nothing wrong. I was thrilled because that meant I would have more pictures for his baby book. The ultrasound was scheduled a week or two later at our local hospital and I met Brian there…with a full bladder, as instructed. The tech took us back to the room and we were geeked to see Cole on the monitor. We asked goofy questions and the tech quietly answered them and then told us to wait and she would be right back. That should have been our first indication something was wrong. Ten minutes, twenty minutes, she didn’t return. Brian went out to try and find someone because my bladder was still full! The tech said we needed to wait in the room. Ten more minutes had passed and the tech returned with a doctor who looked at the monitor some more. He then said to get dressed and wait in the waiting room. Brian and I looked at each other oddly because after my previous ultrasound we didn’t need to wait around. Waiting was torture. The doctor walked in and said he had spoken with the radiologist and they found a tuber on Cole’s heart. My heart sank. Brian and I were not expecting this at all. Ten minutes ago we were joking around and now our world was falling apart. That was the first time we heard the words Tuberous Sclerosis Complex (TSC). He told us we needed to follow up with our doctor in the morning. Brian and I walked out to our cars, a million things spinning around in our heads, hugged and said we would talk when we got home. I watched Brian pull away as I sat sobbing while trying to call my mom on the phone. Our doctor referred us to a high risk OB to assess the situation. They confirmed that it was likely that Cole would have TSC but an official diagnosis had to wait until birth. I had weekly appointments and ultrasounds. At 37 weeks the doctors believed that the tuber was blocking blood flow to the heart and they needed to get Cole out. They tried to mentally prepare us for heart surgery within hours of birth. I was induced on September 4, 2006 (Labor Day that year) and Cole was immediately taken to the NICU. After additional scans, we learned that Cole also had tubers in his brain, too many to count. The next 25 days felt like months. Most nights I would go home and quietly cry myself to sleep, hoping that Brian wouldn’t notice. Cole was touch and go for a while but didn’t need heart surgery after all. He developed complications and one night we almost lost him. I will never forget the day he turned grey. September 13th. Looking back, at the time we didn’t realize just how sick Cole was. The day before we were supposed to take Cole home he had his first shutter spell (seizure). He left the hospital on a seizure medication. The first couple of months were normal, or as normal as we thought they would be as first-time parents. Cole was eating well and very snuggly, however he was starting to miss typical milestones. We started Early On Therapy, and eventually physical therapy, to help strengthen his core. Cole started to have infantile spasms at 6 months and the day after his first birthday he had his first grand mal seizure. 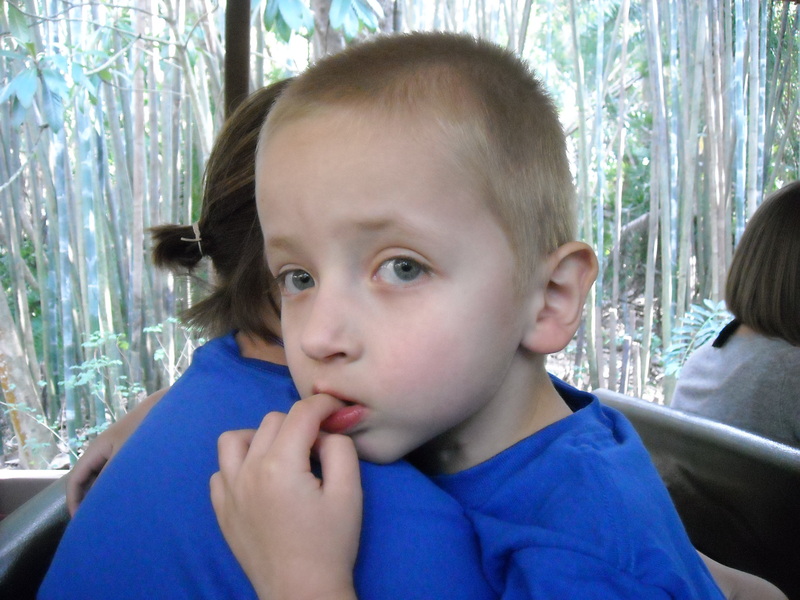 Within Cole’s first year we had tried various seizure meds and nothing worked. Our one last hope before trying ACTH was the Ketogenic Diet. Brian and I thought about it and it made sense to us. Cole wasn’t eating solid table foods yet, and he hadn’t developed a taste for bad foods that we would have to take away for the diet, so this seemed like a good time. Cole was admitted to the hospital and three days later he went home on the diet. Within a few months we noticed a reduction in his spasms and no more grand mals. He was on the diet for three years. In the end, we decided to stop the diet because he started to fall off the growth chart. During a routine urology appointment, after the doctor preformed an ultrasound, he had to tell us that multiple tubers had started to grow on both of Cole’s kidneys. Cole was three years old. We are fortune to live in Grand Rapids, Michigan with a fantastic Children’s Hospital, Spectrum Health and DeVos Children’s Hospital. 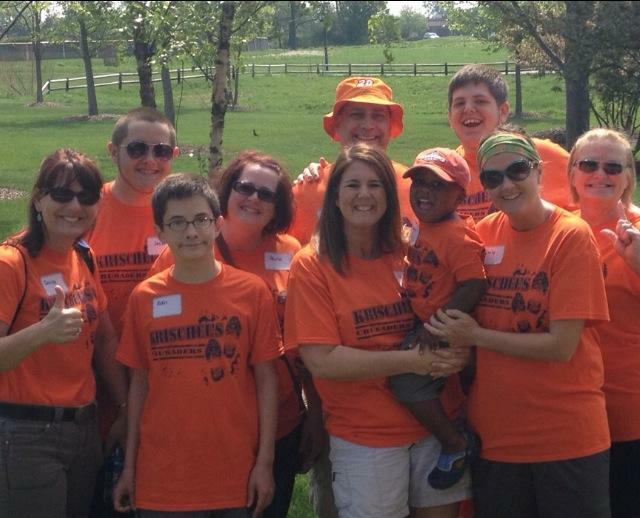 Up until this point, all of Cole’s care could be managed by various specialists locally. After learning of the kidney tubers, we contacted the Tuberous Sclerosis Alliance and asked for recommendations for a nephrologist. That is when we found Dr. Bissler at Cincinnati Children’s Hospital. We spoke with Dr. Bissler over the phone and made an appointment to get a second option on a care plan. Dr. Bissler was fantastic. He took the time to talk to us and make sure we understood all of the options. We agreed with Dr. Bissler and decided to move forward with kidney surgery to embolize the largest tubers. They were the size of golf balls. During Cole’s six month post op visit with Dr. Bissler, we discussed the benefits of Afinitor for Cole’s kidneys and SEGA. Dr. Bissler had also introduced us to Dr. Franz. Dr. Bissler discussed Cole’s history with Dr. Franz, and they both agreed that Cole could benefit from Afinitor. He started it in February 2011. We have noticed many positive changes in Cole, in addition to the kidney tubers shrinking and a slight decrease of the size of the SEGA. In addition to the heart and kidney tubers, Cole has tubers on his eye and skin lesions. Cole is considered globally delayed and is on the autism spectrum. He started attending a special needs preschool when he was two. Watching the bus drive away with my son was scary, but I realize that was one of the best decisions we have made. Cole’s development slowly improved. 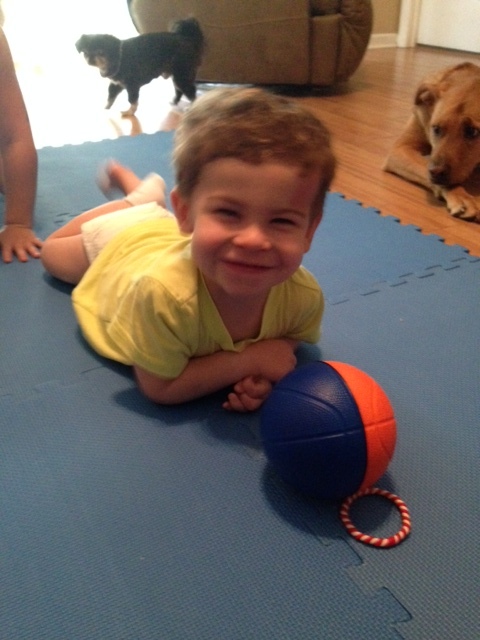 He learned to crawl when he was 2 1/2, walk when he was 3 ½ years old and his speech continues to improve. Today, he has close to 60 words and phrases. He currently attends a special needs school where he has fabulous teachers and support and continues to make positive strides. I believe the Afinitor has helped him come out of the medical haze he was in and is allowing him to move forward with his development. We have noticed the biggest change in him in the last two years since starting Afinitor. He is making intentional eye contact, attempting to repeat new words, initiating play, self feeding, and demonstrating appropriate responses when asked to do simple tasks. We often hear people comment and ask how we do it. There are definitely challenges to raising Cole, but he was our first child and we don’t know any different. In our minds, this is normal. We also have a three-year-old daughter, Lauren. Brian and I were tested and we do not have the TS gene. Lauren does not exhibit any characteristics of TS so we decided not to have her tested. Our lives are full of doctors’ appointments, therapy sessions, sleepless nights, stress, worry and wonder. Cole has closed the gap on his physical challenges (walking) and now we struggle with behavioral (biting and scratching) and emotional issues. 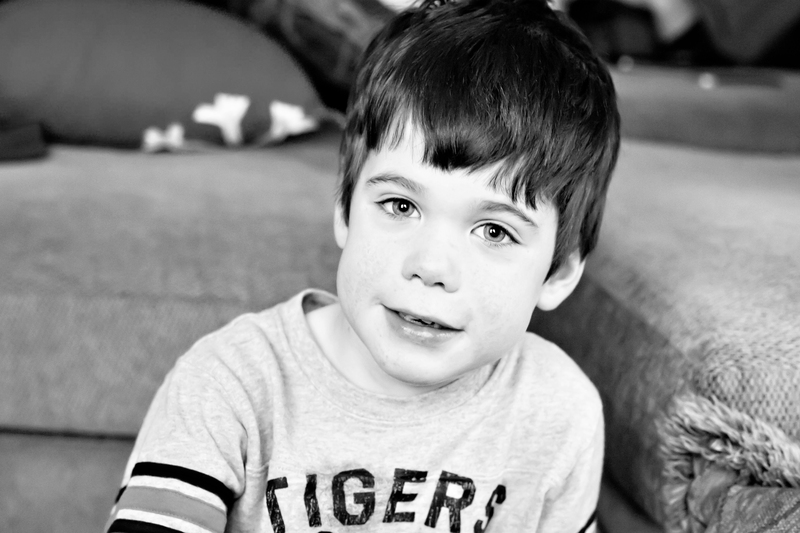 In spite of these challenges, Cole is a lovable, happy, determined 6 ½ year old little boy who loves to snuggle, sing (in his own way), spin balls, ride his bike, swing and run around the backyard. He is on three different seizures meds and is seizure free. It is difficult to look too far in to the future because we never know what will happen, but I can say that things are starting to calm down and feel a little normal. Cole’s care continues to be managed locally and with the Cincinnati TS Clinic. We are very fortunate that Brian’s and my family live close and are willing to help with whatever we need. We definitely couldn’t do this alone. Cole is such a joy and we are very blessed to be his parents. Paula with her husband and three sons, Mason, Joshua and Adin. My story started when I noticed my infant son, who was 11 months old, puking and seizing. We went to our local hospital, and his pediatrician knew it was more than he could help with, so he sent us to Chicago. That was the first time we met Dr. Huttenlocher and started our long journey with TSC. Never in my wildest dreams could I imagine that I had this disorder for 26 years, and was completely unaware. My world was falling apart. I became depressed, and my son was having uncontrollable status epileptic seizures. I not only had to learn all I could about this disease, and the fact we had to live day by day to see how it would affect our boy, I had to learn to accept that I do have this disease and cope with the guilt I felt about giving him this terrible thing! Mason, who is now 17, ended up having global delays; he is severely affected by this disorder, severely autistic, and will never have the ability to live an independent life. We started with therapy at a young age, but did not see much progress for many years. We were feeling compelled to have another child, feeling Mason needed a sibling to help him learn. We prayed a lot and had Joshua. Joshua is now 14, board scholar, and wants to one day be a geneticist and work in gene therapy. 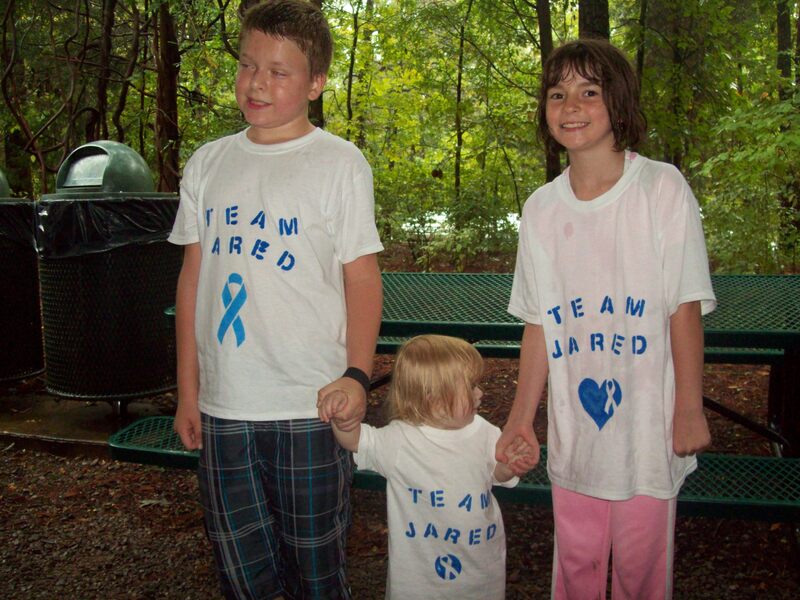 As of now, he shows no signs of having tuberous sclerosis, and he wants to one day find the cure for it. We have advised him to get genetic testing done when he decides to have a family. When my Joshua was 10 months old, I found out I was pregnant again. Eight months later I had Adin. I was not as comfortable about this pregnancy because we were planning on stopping at two. We found out through ultrasound, at seven months along in the pregnancy, that he too would have that terrible disease called tuberous sclerosis. We did a lot of praying, and even though he is autistic and has global delays, he is a ray of sunshine who can brighten anyone’s day. He is considered mild/moderately affected by this disease. He is able to communicate with us, but his older brother is very limited in his speech. Even though he started out with infantile spasms at three months, we have been able to keep his seizures under control fairly well for 13 years. He did have a breakthrough grand mal once, when going through a growth spurt. He has been under control again since 2009. We have spent countless minutes with doctors, tests, speech therapy, occupational therapy, music therapy, physical therapy, behavioral planning, making safety plans for at school and home, and the list goes on. Now our latest scare is me. Recently I found out my tuberous sclerosis is wreaking havoc in both of my kidneys. I get to start the new medicine Afinitor to see if we can save my cyst-filled kidneys from getting any worse. Both of my boys are on it as well for SEGA brain tumors. This is the first time I have been seriously concerned about my own health. I am the main caregiver of my boys because my husband is a very hard-working plumber, who works diligently so we can pay for all the expenses this disorder accrues. There never seems to be a very long break of good health in our family, but because of this disorder, we are stronger, more loving, and cherish all milestones that we conquer! For that I am thankful to TSC. Even though our life is crazy, and the stress seems to pile up constantly, I would not change my life for one second…and continue to look forward to the future!!! Check out her son’s post here.